Once upon a time I would say that I disliked wheat beers, also know as white ales, or Witbier. I think the reason for this is that the ones I had tried to date have been flavourless and served with a slice of orange. True brewers hate this. If they wanted a flavour to be in a beer, they would put it in the beer. I am taking a beer course on Thursday nights called From Beer to There put on by Harbourfront Centre and Mirella Amato of Beerology.ca. In the first three weeks, we have tried 2 wheat beers and I have enjoyed them both. We only have 5 6 oz of a beer when we sample and, after trying this one, wanted to pick up a bottle for myself to try at home. 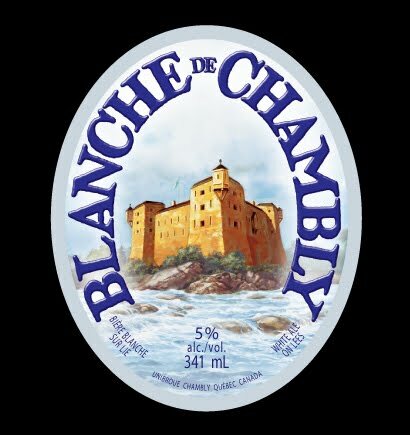 I really enjoyed the Blanche de Chambly when I tried it in week two, when we were pairing beer and food. Much of that class was spent in seeing how the beer complimented the food and vice versa. Time to just try just the beer on its own. Blanche de Chambly is a Belgium style witbier, which has won many awards in the Belgium White Ale category, over the years at various beer competitions, including the World Beer Championships. It comes in a 750 ml bottle and is corked instead of capped. As there is yeast left in the bottle for a secondary fermentation called bottle conditioning, the beer pours a cloudy light straw colour, with plenty of head. This is a beer you need to pour properly. The aroma is of citrus and spice and in the taste, these are quite pronounced. This is a refreshing delicious beer, which I am looking forward to having again on a hot afternoon or evening. And there will not be a slice of orange on the side of the glass. This beer needs no help! I have an idea that there will be more kinds of wheat beer tried as this summer goes on. Let the adventure in wheat beer continue!